How 114A Evidence Act will affect you? Some post some bad stuff on your favorite blog, forum and website, the website could potentially be prosecuted and shutdown (guilty until proven innocent). Website, Facebook and Blog owner would need to filter and moderate every comments (it could mean spending hours filtering through hundreds or thousands of comments everyday), and some might choose to disable commend or feedback due to the lack of manpower and time. People who are not too IT-savvy (could be our parents and family) suffer the high risk of online identity theft (someone stole their email or Facebook password to do bad stuff) or stolen Wifi password could suffer the consequences of others’ irresponsible action. 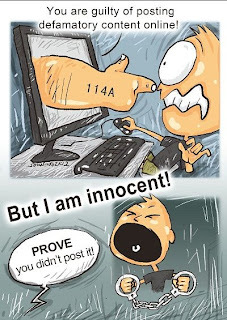 “Guilty until proven innocent” is an act of laziness and irresponsibility meant to intimidate and prevent the public from using the Internet as the platform for freedom of speech and expressions. What is 114A Evidence Act? If an online post is traced back to your username and is considered seditious or defamatory by the government, you are guilty until proven innocent. i) It presumes guilt rather than innocence, which contradicts the basis of many justice systems. ii) It makes Internet intermediaries–parties that provide online community forums, blogging and hosting services–liable for content that is published through their services. This can result in the removal of comment functions, which has a huge impact on the interactive nature of online media favoured by Malaysians. iii) It threatens freedom of expression online through fear. It also reduces the spaces for posting legitimate comments and opinions. iv) It allows hackers and cyber criminals to be free by making the person whose account/computer is hacked liable for any content/data which might have changed. v) It reduces opportunities to be anonymous online which is crucial in promoting a free and open Internet. vi) It is a bad law passed in haste and does not take into account public interest and participation. Say No to "Guilty until proven Innocent"